Which Lower Manhattan Tour is Best for You? This post compares and reviews the various different tours of Lower Manhattan available to you, including our pay-what-you-like tours. We now have a GPS-enabled audio tour of Lower Manhattan, led by one of our tour guides, that you could take with you anytime. We at Free Tours by Foot are very proud to offer several tours that include Lower Manhattan, including our anytime audio tour of the area. Below the tour calendar, we detail our Lower Manhattan Walking Tour, but we also offer tours of the World Trade Center and 9/11 Memorial, the Brooklyn Bridge and the Statue of Liberty and Ellis Island. Daily, 3-hour Downtown Manhattan Tour, which covers part of Lower Manhattan plus Chinatown, Little Italy and SoHo. A 6 hour NYC in One Day Tour, which combines the 3 hour Downtown Tour and adds to it Greenwich Village and the High Line. It is here, as much as anywhere, where American history started. It’s where the first US Congress assembled and produced the Bill of Rights and where President George Washington took his first oath of office. It’s here where the world’s most important stock exchange and one of the most famous bridges stand. And it is here where an unspeakable tragedy took place and where a rebirth is underway. Join us as we stroll through the ancient streets of Manhattan’s Financial District and explain the rich history of New York City. From a Dutch trading post to a world financial capital, no stone is left unturned. This tour starts from the Battery Park, where you will see from a distance the Statue of Liberty and Ellis Island, then makes its way through Wall Street and the Financial District, ending up near City Hall and the World Trade Center area. At the end of the tour, you will be near the foot of the Brooklyn Bridge. Why not take a walk over it? *Seen from a distance. For more information on the sites we will cover, take a look at our self-guided Lower Manhattan Tour. Reservations: REQUIRED. Click here to reserve. Groups of 10 or more should visit our groups page. 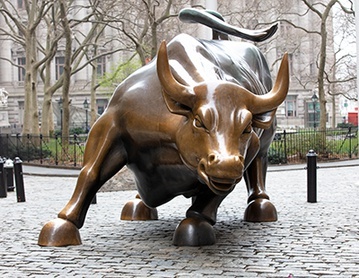 Where: At the Charging Bull statue, 26 Broadway. Click our Google map for directions to the tour or click here for detailed walking directions from nearby subway stations. Look for your guide with the Free Tours by Foot logo. Tour ends at City Hall Park. When: @9:45am on Mondays & Fridays (March-Dec). @2pm Mondays (Jan-March) View Our Full Tour Calendar. 75% of this tour is covered on our @10 am daily Lower Manhattan, Chinatown, SoHo, and Little Italy Tour, as well as our Downtown Manhattan 6 hour Tour, which runs @10, am almost daily. You could take our audio tour of Lower Manhattan anytime you like. For those interested in Revolutionary War history, we highly recommend that you take a tour with Patriot Tours. This highly-rated tour company uses a storytelling format and review of authentic documents, which will give you as close to a first-hand experience you can get of life as it was during Revolutionary Era New York. Take a trip back in time to NYC before, during and after the American Revolution and enter the world of Alexander Hamilton and Aaron Burr. Visit the sites that were part of Hamilton’s everyday life including St. Paul’s Chapel, Federal Hall, and Trinity Church Graveyard, some of the oldest remaining historic sites in New York City. Tours are 2.5 hours and run on Wednesdays at 10 am, Saturdays at 11 am, and Tuesdays and Thursdays at Noon. Follow your guide through what was once British-occupied precolonial New York. Learn about what daily life was like in New York in the 1770’s as well as learn about infamous spy rings, some of which met secretly at Fraunces Tavern, which you will visit. Learn more about the famous historical figures you already know such as George Washington and Alexander Hamilton as well as lesser known but just as important patriots like John Jay. This tour also takes you to historic, tree-lined Brooklyn Heights. This tour is perfect for fans of the TV show Turn. Tours run 10:00 am Wednesdays, Fridays, 11 am Saturdays, 12:00 pm Mondays, Tuesdays, Thursdays. There are no bus companies that exclusively cover Lower Manhattan and the Financial District on its own, but several do spend some considerable time here. We have listed a quick summary of the companies that have stops in the area below, but do take a read of our post comparing the various NYC bus tours. Several of these companies offer combo and discount tickets, that include boat tours and could really add up in savings. South Street – South Street Seaport and boat and helicopter tours. Learn more about hop-on-hop-off bus tickets. Other bus tours also visit Lower Manhattan. These companies usually make two stops, one at the World Trade Center and another on Wall Street. Some, like USA Guided Tours, also include a boat cruise past the Statue of Liberty and Ellis Island. Lower Manhattan has miles of waterfront bike lanes and is a great place to safely bike along, whether on your own or on a guided tour. There are several bike rental and tour outfits located in or near South Street Seaport. Pick up bikes and tour at 110 South Street near the South Street Seaport (map). Open daily from 9 am – 7 pm. This company offers a 2-hour bike tour that rides over the Brooklyn Bridge and then rides through Lower Manhattan. The prices are listed below, but if you use promo code FTFB you will get a 20% discount. This tour and rentals are included at no additional cost if you purchase the New York Pass, the Sightseeing Pass or the Explorer Pass (tourist attraction discount passes). Pier 17 at the South Street Seaport (South Street and Fulton Street) or Pier 84 at Hudson River Park at (12th Avenue and West 43rd Street). Open 9 am daily. Prices vary depending on the type of bike you choose. Locks, helmets, and detailed map come included. Free 24-hour rental of a Beach Cruiser style-bike with a New York PASS. Lower Manhattan is the launching point for several boat tours and services, including several sightseeing cruises with stops in Lower Manhattan, including South Street Seaport and Battery Park. Be sure to read our post comparing all boat tour options that you have in NYC. The area is also the location for the tourist heliport. Be sure to read our post on choosing the best helicopter tour for you.